time to harvest the ginger and tumeric. i love growing them because they are so easy to grow in pots and the time window to harvest them is flexible. you can see from the photos below that the leaves are dying and the plants look shabby which is just you want, because that means they are ready to harvest. to plant them you take a knob of either one that looks healthy and cut the little fingers off making sure that each piece has a little bump on it which is where the new sprout will grow from. i put 4 or 5 pieces about 2 inches below the soil in each pot and put in an area that will get good sun. keep well watered and i add an inch of compost to the top of soil each month and that’s it. it grows year round here in hawaii but if you’re in a climate that gets chilly, you’ll want to plant in the spring and they’ll be ready to harvest at the end of the summer. it does take 5 or 6 months before you can harvest but well worth it. here are the knobs after i’ve taken them out of the pots and cut off the stems. the ginger seems to always be more prolific and although it doesn’t show up in the photos, it looks spectacular with little pink young shoots at the ends, and when you break a piece in half, the smell is wonderful even with my loss of smell. it has a sweet and spicy smell at the same time. then i break them into pieces and scrub them clean. since they are so fresh, the skin is thin so you don’t need to peel them. i like to slice them into little half inch slices and i put them into ziplocs and into the freezer they go. i pull out a few pieces when i need them and sit them on the counter, and they defrost in just a couple of minutes. for my morning smoothie they can go directly from the freezer into the magic bullet. they are also delicious chopped and added to curries and stir fries. i also simmer the ginger to make tea. 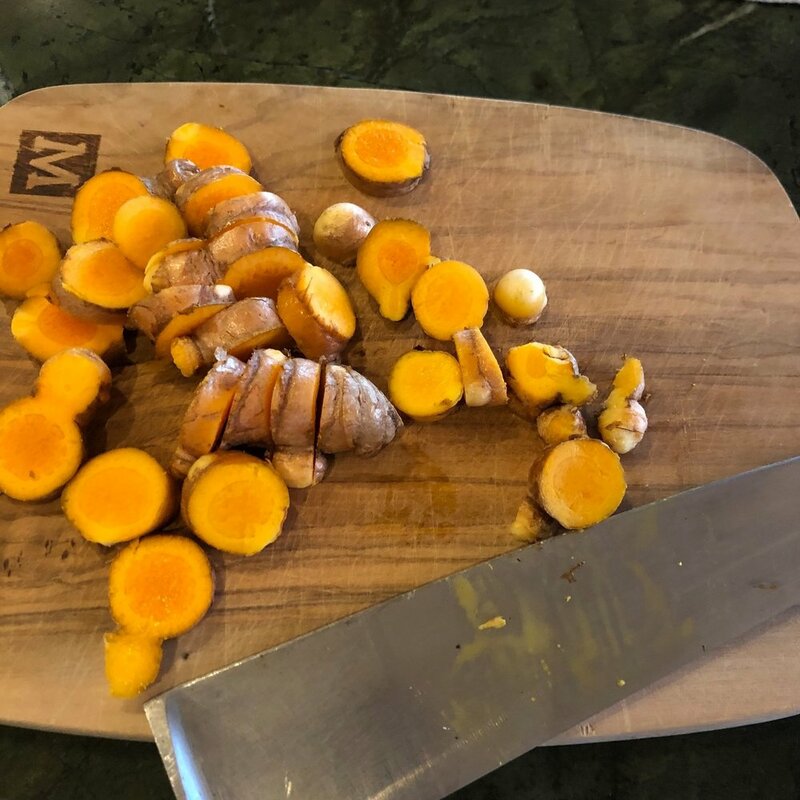 there is lots of information about how both tumeric and ginger and their health benefits and there is even some research being done to see if it can help with parkinson’s. happy gardening!